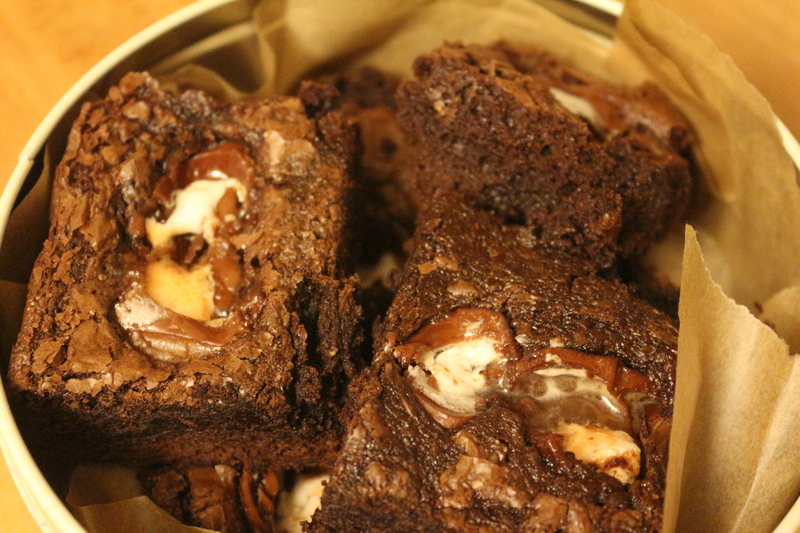 If you haven’t totally sickened yourself with copious amounts of chocolate already then these brownies may well be right up your street. 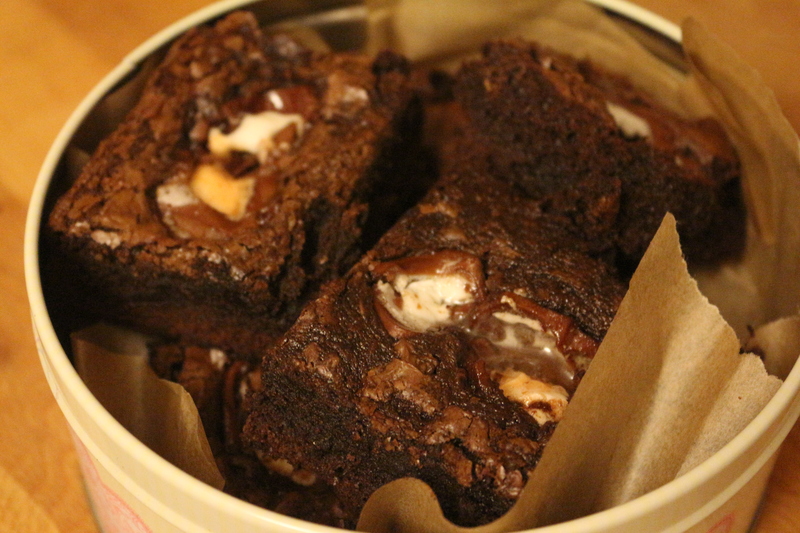 I made these last week and they went down a storm in the office and at home. 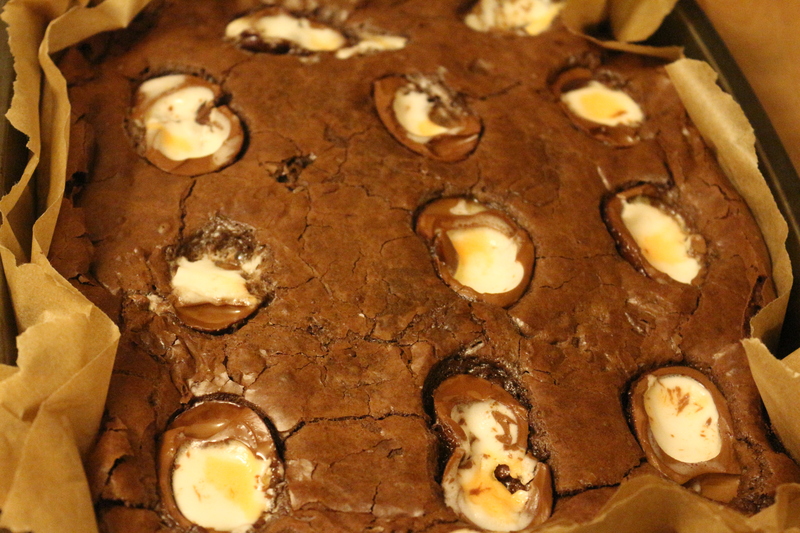 A word of warning to the wise: each brownie will have half a creme egg nestled in amongst the spongey goodness. 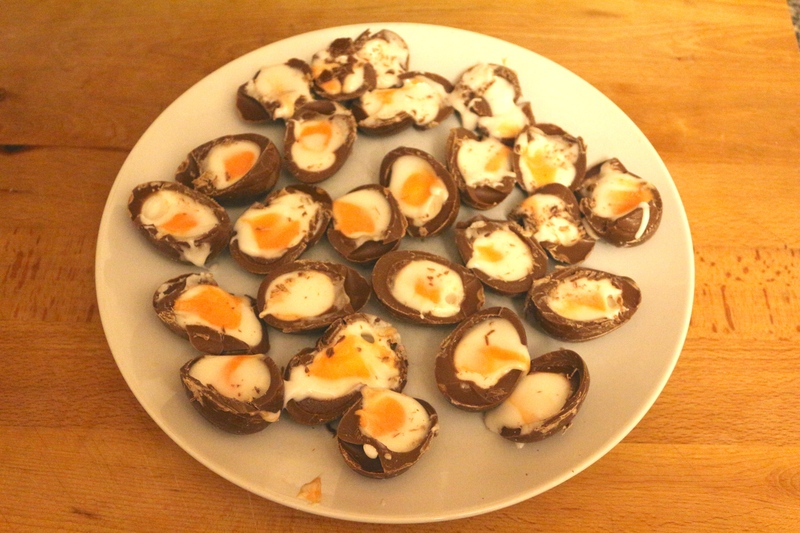 If that’s a touch too much then have a look for mini Crème Eggs to pop in instead. First thing’s first: Preheat your oven to 160°C and grease a 20cm baking tin. I didn’t have one so used a roasting dish. To help you get your brownies out easily make a cross out of greaseproof paper and lay it inside the tin as well so you can lift your brownies out easily once they have cooled. Cutting your Crème Eggs in two is tricky and one I must admit I didn’t do wonderfully well. Use a share knife – not a task for little hands I’m afraid – and put your halved eggs into the fridge to stop the fondant yolk dribbling out. Then melt your butter and dark chocolate together in the microwave or in a heatproof bowl over hot water and allow to cool. Crack all three of your hen’s eggs into a bowl and tip in your caster sugar. Using an electric whisk whip up the mixture until it’s thick and creamy in consistency. (This can take between 3 and 8 minutes, hence the need for an electric whisk! There are no prizes for using a hand whisk here.) You’ll know when your mixture is perfectly combined when it swells to almost double its size. Pour in the cooled chocolate-butter mixture and gently fold together using a metal spoon. Holding a sieve over your bowl sift the cocoa and flour together and fold this all in with your spoon. The easiest way to do this is to ‘lift’ your mixture from the edges of the bowl and covering the dry ingredients with it. Keep folding until you know it’s all combined. Pour the mixture into your baking tray – or roasting dish – smooth the top and pop into the oven for 15 minutes. 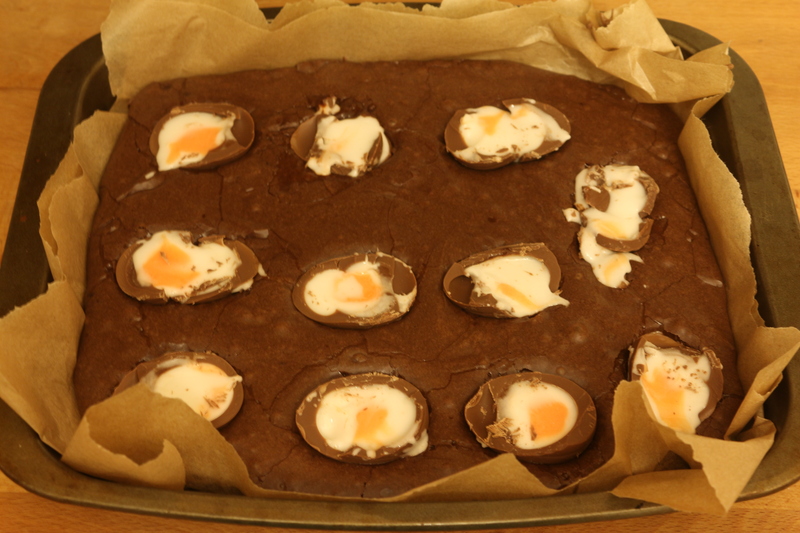 After 15 minutes remove from the oven and place your Crème Egg halves – yolks up – into your brownie. Press them in lightly but not so much that they sink to the bottom! Try to space them out as evenly as possible. Pop your tin back into the oven for another 5-10 minutes or until you can press the back of a spoon on the top of the brownie and it bounces back without sticking to the spoon. You can also test it by putting a clean knife into the brownies and make sure no mixture sticks to it when you pull it out. Once cooked take your dish out of the oven and allow it to cool until your brownie is cool to touch.